Working alongside the UNHCR to raise funds for Syrian Refugees. 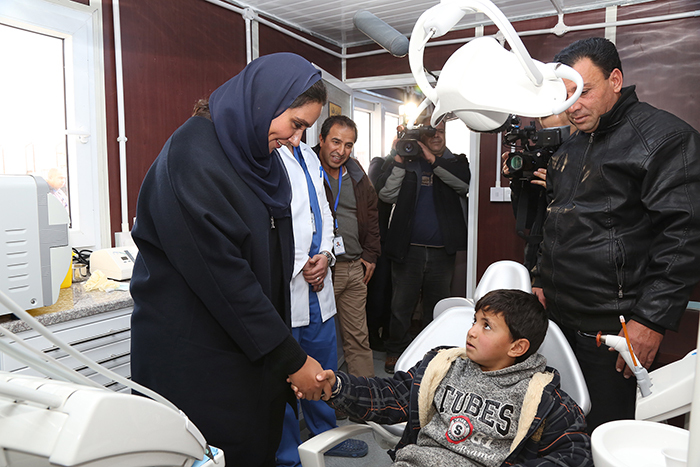 Amman, Jordan – 20 December 2016 – Saudi Humanitarian, Dr. Mariam Saleh Binladen, has teamed up with the Jordan Hashemite Charity Organization (JHCO) and IMC Hospital, to open a unique dental clinic for Syrian refugees. The first-of-its-kind facility in the region was officially inaugurated today at Al Azraq camp in Jordan, which currently plays home to more than 55,000 Syrian refugees. The ‘Dr. Mariam Dental Clinic’ was built at the IMC Hospital within the camp, and has the capability to attend to thousands of refugees in 2017, providing crucial oral care, all cost free. Earlier this year, as part of her efforts to shed light on the plight of Syrian refugees, Mariam undertook a series of incredible, world-record breaking initiatives. She became the first woman ever to swim the entire length of the River Thames in London (101 miles), and the first Saudi woman to complete an assisted swim across the English Channel (21 miles). In 2015, Mariam swam the Hellespont open water swim in Turkey and was the first Saudi female to complete the race from Europe to Asia and in doing so, Dr. Mariam managed to raise the funds for the dental clinic. Additionally, working alongside the United Nations High Commissioner for Refugees (UNHCR), she has so far raised more than half a million US dollars. A dentist by profession, Dr. Mariam’s new clinic is the first of its kind in the Middle East region, as she continues to relentlessly act on her commit to improving the lives of orphaned Syrian refugees. “More than four million Syrians have been uprooted from their homeland, half which are 17 or younger – this is truly the greatest humanitarian disaster of our time,” said Dr. Mariam. “Many of these children have no family, no support network, no one to care for them. As a young woman from the Middle East, I was moved to do all I can to help those in need. The dental clinic is a necessary, but also wonderful facility for the orphaned children in Al Azraq refugee camp. As a dentist from the region, I am humbled to see something so close to my heart open its doors to those in need,” she continued. Today, seven percent of Jordan’s national population is registered Syrian refugees, totaling around 655,831. The Kingdom now homes the second largest volume of refugees per 1,000 inhabitants in the world. “We are proud of Dr. Mariam. She is an example of an athletic and philanthropic woman from the region who can make a difference in refugees’ lives,” said Khaled Khalifa, UNHCR’s Regional Representative to the GCC Countries. Mariam will be venturing into further initiatives in 2017, and will be working closely with the UNHCR and other humanitarian bodies, to continue her pledge to supporting Syrian Refugees across the world.